Okay this is very important because I want to save you all from one of the most common mistakes I see home owners making when they renovate or design their new build. And that is, installing a contemporary linear fireplace in a home with traditional or transitional architecture because it looks ‘new and trendy’. Here’s the issue. If you are not immersed in the language of interior design, it’s too easy to equate ‘modern’ or ‘contemporary’ with ‘new’. And easy to think ‘new’ is better. Instead of asking the very important question, does this style of fireplace relate to the architectural style of our home? ‘Contemporary’ is actually not simply ‘new’, it’s a distinct design style. So I want to clear this up, because I see this mistake all the time. Your fireplace needs to relate as perfectly as possible to the style of your kitchen. And the style of your kitchen should make sense, of course, with the overall architectural style of your house. The classic fireplace above belongs in a home with a kitchen that looks like this (below). Related post: Should Your Great Room Relate to the Kitchen? So please, before you install a modern linear gas fireplace right across from your shaker or raised panel kitchen STOP! It will only look like a mishmash of styles and not in a good way. Am I saying you shouldn’t ever mix styles? Of course not, it’s very tricky to pull off well, but it can be done. HOWEVER, a creative mix is better done with moveable soft furnishings. Architectural elements that are stuck down should look like they belong together. Can this rule ever be broken? Sure, if you’re a professional and you know the rules well enough to break them for good reason. However, if you are a non-professional, you’ll be much happier with the result if you don’t try to break the rules just to be ‘different’. Anyone who’s read my blog for any amount of time knows that I champion a simple, timeless look when it comes to structure and finishes. In other words, anything that is glued down somewhat permanently should be as simple and classic as possible. Boring even. And that’s because all the fun can be had in decorating which is much easier to change up when the time comes. And here’s the thing, I think the goldilocks style tends to be Transitional Style. Here’s why. My Promontory project (above) was done in Transitional Style. The kitchen, fireplace and millwork are all simple and classic and I added interest and had fun with decorating. Here’s the kitchen across the room from this fireplace (below). See how they look like they belong together? Transitional Style embraces the comfort and layering of Traditional Style (timeless and liveable), but pulls in the best features of Contemporary and Modern Styles (by the way, there is a distinction between Contemporary and Modern, they are similar but not the same, but that is for another post). Those features are clean lines and a fresh, uncluttered look. And once you get a feel for the differences between these design styles, it becomes much easier to make the right choices for your new build or renovation. Contemporary Style has a lot of appeal because it looks edgy and current, clean and uncluttered. However, it tends to be an expensive look to pull off. This is because, it is so highly edited that contemporary rooms are best designed all in one fell swoop by a very good designer. The less elements you are working with, the more perfect each needs to be. Also, because it’s so pared down, interest comes from quality. Shape, colour and texture are hugely important. It’s generally expensive to do it well. It’s also highly limiting. It’s much more difficult to inject whimsy, colour and personality into such a pared down look. For example, you will rarely find a pattern that is much more than texture in a good contemporary room. While there are many new interpretations of Traditional Style that are fresher, Textbook Traditional Style, trades, by contrast, on decadence and fussy details. Which is also an expensive look to pull off well. And while there is a big trend towards Traditional Style these days to recapture some of those charming details (driven mostly by high end designers who can pull it off), it generally does not have broad appeal, and is not the most budget friendly or liveable style. Enter Transitional Style. Taking the best of both worlds and makes a liveable hybrid, it features cleaner lines and less fussiness, but retains some layering and comfort. It also allows for some whimsical colour and pattern. Transitional Style’s versatility gives it broad appeal. OK, so Interior Design 101 out of the way, let’s get back to fireplaces. 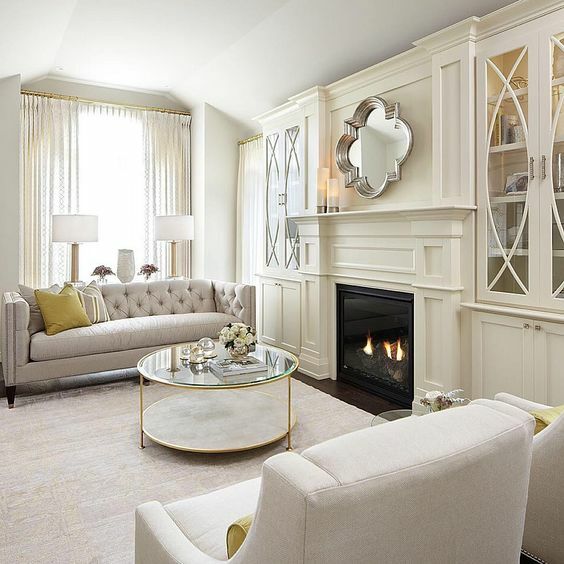 What Does a Classic Transitional Fireplace Look Like? This is the style of fireplace that I consider to be the most versatile and timeless. 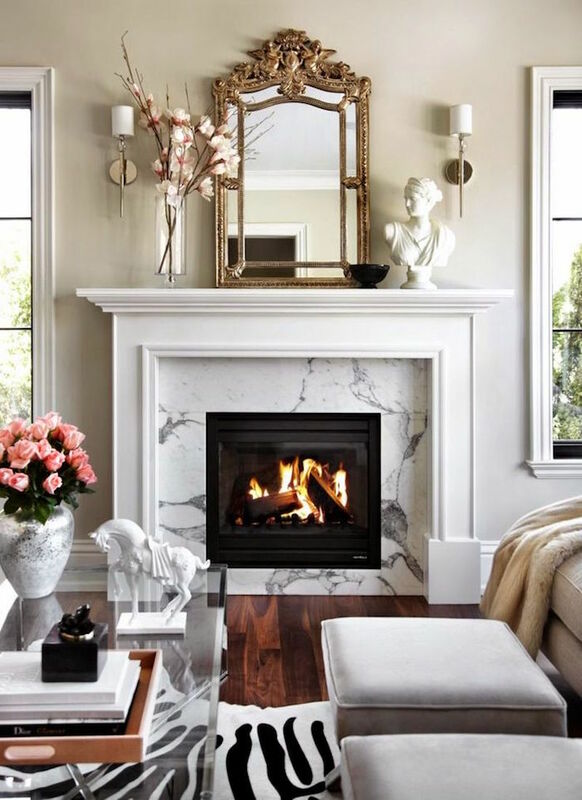 A classic transitional white millwork fireplace like this below. Here’s another pretty one with a black fireproof surround below. The millwork has interest, but the lines are simple and clean, not too curvy or ornate. 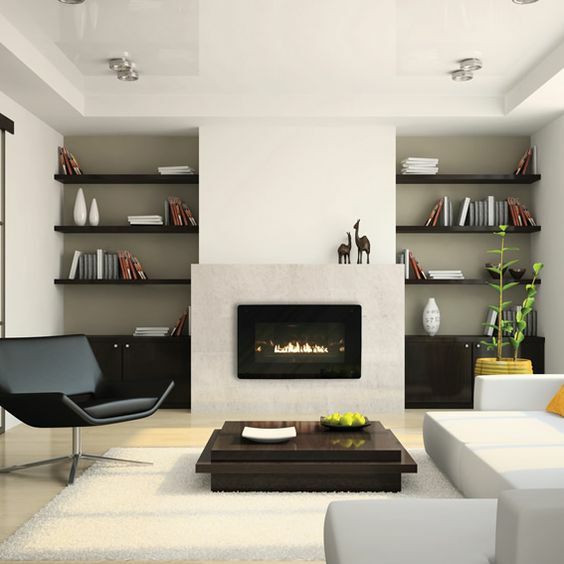 And here’s what a contemporary fireplace with a linear insert should look like (below). 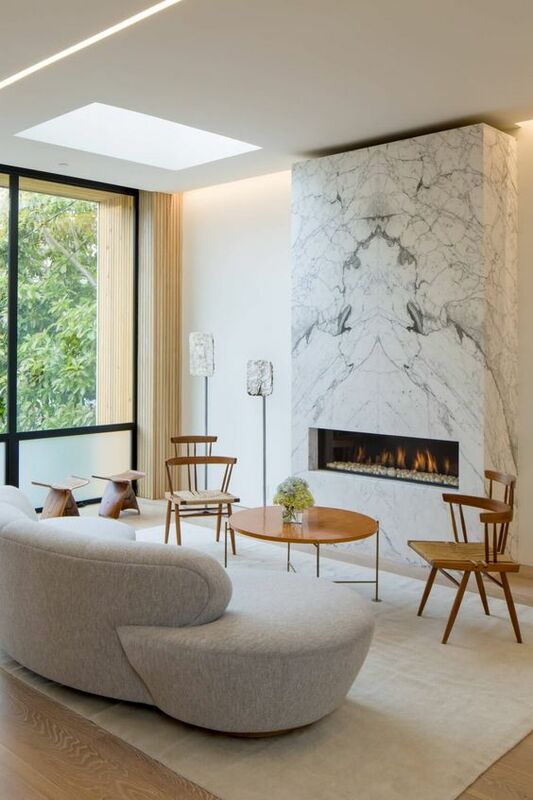 A contemporary linear fireplace looks best surrounded by slick materials like stone, marble or concrete and belongs in a home with an equally pared down modern kitchen with slab front cabinets like this below. I much prefer sleeker materials over stacked or rough hewn stone on a contemporary style fireplace. Stone tends to make them look dated and less elegant just like it does on a more traditional fireplace. And a kitchen like this (above) belongs in contemporary or modern home like this (below). Related post: Which Stone Colour is Best for Your Fireplace Surround? Since contemporary style does have broad appeal as being edgy and new, builders are embracing some elements of contemporary style and mashing them up with transitional styles with varying degrees of success. To be honest, they’re mostly bad, and I prefer homes that are designed to more clearly follow established architectural styles. Coherence of style in architectural and fixed elements. There are too many bad hybrids being built unfortunately. And once you recognize the hallmarks of the different styles, you can recognize when a builder has taken some liberties with mixing them up. A linear fireplace in no way belongs inside a traditional fireplace (above). It’s modern and the fireplace design needs to be modern as well (below). However, I think the confusion happens when you walk into a show room and see a cool “new and modern” linear insert, fall in love with it, and never ask yourself whether it belongs in your house, married to your kitchen. Those are the kinds of questions designers ask all the time, but if you’re not a designer this is such an easy mistake to make. And please don’t worry if you’ve already installed a fireplace that doesn’t relate. All is absolutely not lost. All you need to do is inject some love with decorating and styling and you can create a lovely, cozy room. Maria, 1000% agree with you! I love the consistency and simplicity that you teach in your blog and in your Color Workshop. It has changed the way I view everything, from my color consulting business to everyday life. This article clearly explains why you shouldn’t mix styles, and I will use it as a reference for my clients. Thanks! Hello. Really enjoy your blogs. 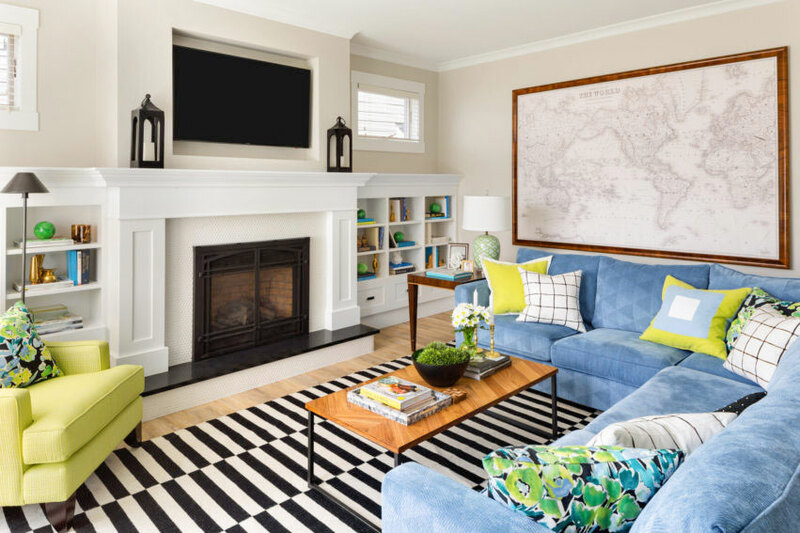 We are doing a transitional new build and found that it is very popular and practical to put a tv above a fireplace as they are both focal points in many rooms. With tv size ever increasing (and it’s not going away), it looks awkward (top heavy, unbalanced) to have a black large tv above a narrower traditional black fireplace. Having a linear fireplace with a width close to the tv width above seems to be a cleaner, coordinated look, even on transitional homes. It would be great if you could comment or blog about incorporating large TVs and TVs with fireplaces in transitional designs. Fascinating! I wouldn’t put a linear fireplace in a typical home but I never thought about it in terms of relating to the kitchen. Great advice. I’ve been staring at our fireplace lately which is a black insert at seat level (with wrap around painted brick seat) in a corner tower of white painted brick veneer, no mantel or surround of any kind. The nearby kitchen is nearly shaker with just a simple bead in the panel, also all painted out white. I’ve only seen my kind of fireplace in pins with a brown wooden beam as a mantel. I’m curious what you think of those? Not my favorite but there are only 6″ either side of our insert before the brick angles back to the walls so there’s insufficient room to build out a millwork mantel that has pleasing proportions. Maria loved this post and all your photo examples. I myself love contemporary . It works for me as I love simple . accept contemporary or modern Period . Thanks for a good post and great examples . Hi Maria, and thanks for this excellent post. I think I’ve unconciously followed your advice here because I too like the fun of bringing in color and style through accessories. A related question that perhaps you’ve previously addressed: what about a raised hearth fireplace that is built of the same brick as the home? Upon arrival into this (30 yr old) home almost 10 yrs ago, I had a millwork shelf and support below (only) built onto the brick fireplace in our family room. Our kitchen opens onto this room and now I know they relate well. :). I continue to wonder if we should paint the exposed brick area. It’s a peach colored brick that I would not select but sort of disappears. Thanks in advance for your thoughts. A lot of builders don’t know what they don’t know as far as architecture. As you pointed out, Maria, the mish mash of design elements can be awful. But . . . I don’t agree that Traditional Style is necessarily less livable. I guess, because Traditional Style can mean so many different styles and levels of formality under the “traditional” umbrella. I’ve seen traditional rooms that looked livable and transitional rooms that didn’t. And vice versa. 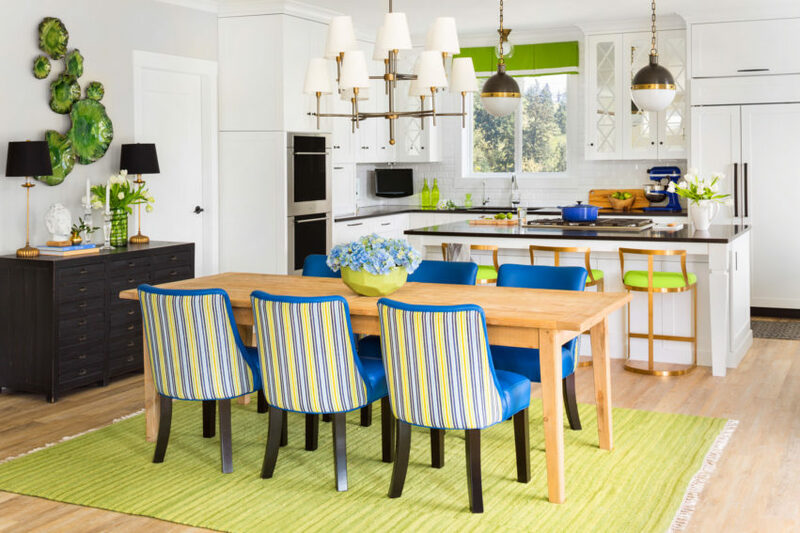 Some people do a more whimsical cottage look that is definitely not transitional, but very livable. There is the Swedish Gustavian look that is very traditional, but more relaxed. Some even mix elements of traditional and mid-century and make it look brilliant. “Traditional” is such a wide range. There are so many traditional design magazines out there. A lot of people prefer it, though I think you are right that the general public doesn’t go for that. I’ve followed traditional design magazines for ages. The “New Traditional” thing has been going on for a good 20 years now. I’ve seen so many non-fussy New Traditional rooms over the years and I’m a huge fan of that look, along with Transitional looks that lean a little traditional like some of the photos you posted. Yes! I LOVE traditional looks without the clutter -Ralph Lauren minus the dust collectors. And you can find lots of wonderful traditional furniture at estate sales and auctions; you must be willing to refurbish/refinish it, however. I also agree with Maria in that, in my area, it is extremely difficult to find an affordable designer who will decorate in this style. Alas. Yes, Laura, antiques are an option. I read they are getting a lot less expensive because younger generations currently aren’t interested in them. There are also many furniture companies still manufacturing traditional furniture these days. yes, a design professional understands; we see so much out there! yes, there is a big difference between modern and contemporary…and the $$$ or lack of it shows. and lastly, builders are not architects or designers, but they are cutting these professionals out, driving the design, and making wrong or awkward choices. This is why several of the HGTV home decorating shows, like Property Brothers, bug me – they put modern and/or contemporary into old homes. They do nice work, it always looks good, but so many of them just don’t belong in the older victorians and ranches in which they’re installed. If you want modern and contemporary, don’t buy a vintage 1930s or 1950s house to start with. This is another excellent post. I’ve been working on a design for a fireplace and built ins for our drywall box of a living room and there’s many DIY designs out there that don’t quite look right to my eye. I’d love to hear your thoughts about what the hearth should look like – none, level with floor, raised. Love this article with the examples of a variety of styles! It is hard to be a purest in this day and age. For example using only “traditional” furnishings is hard to do because as you stated it is an expensive look. I do like the so called traditional style because it looks so inviting and homey. Lots of upholstered pieces, chintz, botanicals, etc. If you go back to the etymology of the word it means styles of the past plus the designs and designers of the time. That being said I feel an eclectic style is the best. (a collection of styles) It is easy to put harmonious pieces together by adding color to bring it all together. I have always been concerned about the facade of a home and how to bring that style into the design inside. Sometimes you don’t even know what style the house is from the outside because of such a mesh mash that the architects have put together. I have clients say “I don’t like contemporary” but I do like modern. It is hard to educate clients on their terminology. It is fun to see the concept of different design styles. I guess art is just in the eye of the beholder! I’m wondering what you would call the style of so many ordinary houses in the northeast, where I live. They were built in the 50s and 60s, are not mid-century modern, are not fake colonial, are not cottages or bungalows, or really anything at all. Some of them are called raised ranches, but they don’t look anything like a true sprawling ranch house. That’s the kind of house I live in. When we renovated, I just did what I liked, making sure that fixed elements went together reasonably well, and repeating where I could: shaker style kitchen cabs and living room built-ins, Carrara marble touches in the bathroom carried through the kitchen as counters and the living room as fireplace surround, the baseboards and trim changed to be the same throughout the public areas of the house (from the original skimpy clamshell moldings), etc. I’m very happy with the result, guests love it, but I have no idea what a designer would think! Thank you thank you!!! My architect advised us to put a modern linear fireplace into our (currently being gutted and expanded) 1895 farmhouse. We are putting in white shaker cabinets with marble lookalike countertops, and it has been bothering me for months. Now I understand why!! Can I ask one question? What do you think about this trend of mixing white with wood (sometimes reclaimed wood)? For example, white surrounding but wood mantle, white kitchen with wood open shelves. I see it a lot in the modern farmhouse look (which we’re imitating) and I love it, but wonder if it will look dated in a few years. I think the wood warms up a white kitchen if it’s done right. Everything is dated after years go by, but in my world the definition of ‘dated’ is this: How much money does it take to insert a new colour or a new pattern? Can we paint the kitchen a new colour or does it forever have to be ‘gold’ or ‘green’ because you have gold and green blotchy slate tile on the floor? I’ve never given this any thought before. Probably because I’ve never been in the position to select my own fireplace. And I’ve never lived in a modern space. But your feelings about this make so much sense. I personally love to add some modern touches to my home. But I would never do it with something as permanent as a fireplace. That still does not explain my fireplace. Its just below 13 feel tall and 10 feet wide and all red brick with black grout. It takes one wall in my room. he mantel is over 5 feet 5 inches tall and there is a seat. The advice in this post was for everyone about to install a linear fireplace in a traditional house (bad idea), or install one inside a traditional mantel (even worse).